With vertical tiling projects on the increase, Stuart Nicholson, roof systems director from Marley, gives some top tips on membrane installation. You might think vertical tiling is only used for adding clay detail to the front of homes, but actually it is becoming increasingly popular as a cost-effective cladding method. With skills and material shortages, housebuilders have been looking for alternatives to brick and the ability to offer vertical tiling services for exterior walls opens up additional opportunities for professional roofers and builders. While extending tiling beyond the roof onto the walls is relatively straightforward, there are some important things you need to consider when it comes to the choice of materials, particularly membranes. When installing clay or other tiles vertically on a timber frame, a breathable, or vapour permeable membrane, is used to prevent moisture, snow and wind, from penetrating into the frame. This permeable layer also assists in ventilating the structure, avoiding the build-up of condensation. Some manufacturers do sell separate breathable membranes specifically for this type of wall construction. However, the increasing amount of timber frame buildings means there is growing demand for roofing underlays that can also be used as a breathable membrane for wall applications as well. This means that you would only need to order and stock one membrane, reducing waste and saving time on site switching from one roll to another. 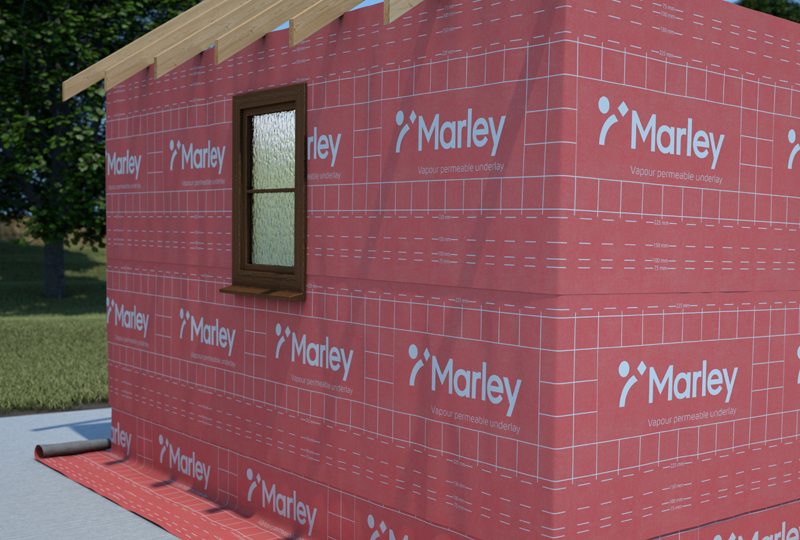 For this reason, Marley’s vapour Ppermeable (breathable) Uunderlay has the benefit that, as well as roofs, it can also be used as a breather membrane in timber-frame walls with a cavity and a masonry outer leaf, weatherboarding or tile/slate cladding. However, this is not the case for all roofing underlays – so make sure you check first. If you’re tiling both the roof and the walls, to make it simpler, you could use the same membrane. However, not all roofing underlays will be suitable, so check the product has BBA Certification for use in timber frame walls, or contact the manufacturer if in doubt. Make sure you install the battens, underlay and tiles in accordance with the recommendations given in NHBC Standards, Chapter 6.2 External timber framed walls, where appropriate. This states that breather membranes must be vapour resistant to less than 0.6MNs/g, capable of resisting water penetration, durable and adequately strong. It also gives clear guidance on construction and fixings standards. To meet these fixings standards, make sure you secure the underlay at regular intervals, not exceeding 500mm, with austenitic stainless-steel staples or nails to prevent damage by wind action. Upper layers should overlap lower layers to shed water away from the sheathing. Stagger vertical laps wherever possible. Horizontal laps should not be more than 100mm and vertical laps not more than 150mm. Mark the positions of the studs on the face of the breather membranes, preferably by tape, to enable fixing of wall ties and battens – this is essential. Ensure that you protect the lowest timbers in the wall with the breather membrane. Marley’s high performance, UV-resistant universal vapour permeable underlays are manufactured using the latest materials and processes and are fully compliant with BS 5534 and NHBC standards. They are suitable for both wall and roof applications, with unrestricted use in wind zones 1-5 and come complete with integrated tape for tight, durable joints and quicker installation.